Dr. Jennifer T. Edwards - Texas Author, Researcher, and Social Media Trainer: How to Create an Undergraduate Conference for Your Classes! 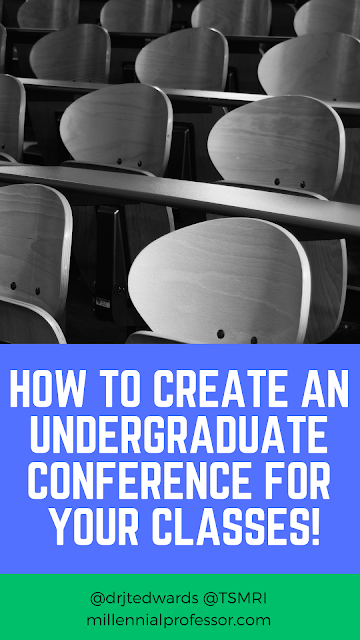 How to Create an Undergraduate Conference for Your Classes! This year, I decided to think outside of the box with my undergraduate Organizational Communication class by infusing a high impact undergraduate research initiative. This means, each week, we examined an aspect of organizational communication and then they researched the concept as well. By the end of the semester, we had a COMPLETE paper and a COMPLETE undergraduate research conference! You guys know that I am ALL ABOUT social media and we decided to capture the presentations virtually by highlighting each event on Facebook Live. Here was the practice session - "Practicing the Millennial Recruitment Research Presentation"
Here's the advertisement video - Join us NOW for the Millennial Recruitment Forum at Tarleton State University. I was very proud of their progress and I hope to continue to integrate the presentations and undergraduate research in future classes. I want to issue a HUGE shout out to the students! Great job team!